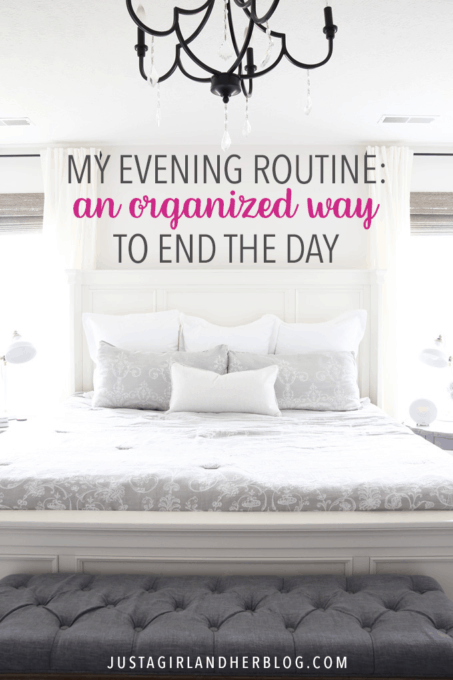 When I have a solid evening routine in place, I can be so much more productive the next day! These few simple steps help me end the day in an organized way. Last week I talked all about my morning routine and how it helps me be more productive throughout the day. While morning routine helps me set my focus from the very beginning of the day, I would say that planning to be productive starts even earlier– during my evening routine the night before! I keep it very simple, but when I do these few easy tasks each evening, it really helps to make the next day go more smoothly. My evening routine has gone through a lot of changes in the past few years. 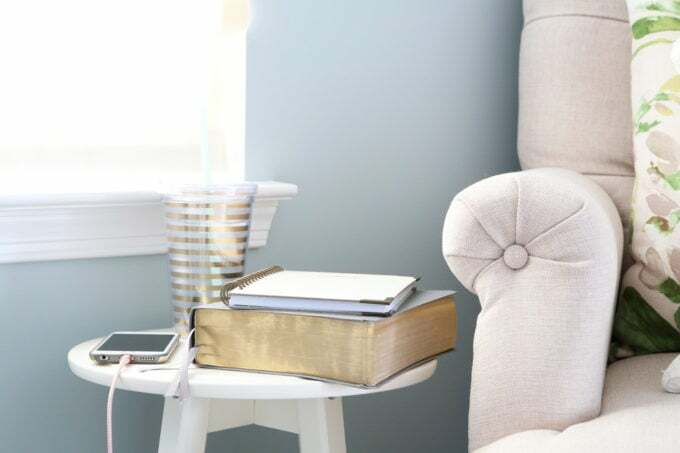 When I first started blogging, the period after we put the boys to bed was my primary work time, so I used to hop on my computer and work until the wee hours of the morning. I was getting very little sleep, which made me cranky, lethargic, and unproductive the next day. It wasn’t a good situation. So after Donnie started working on the blog with me full time, I told myself that I needed to abandon my late night working hours. With him home to help with the boys, I had more time during the day to work; there was no reason to keep up my sleep deprived ways. We all know how that usually turns out. Again, I would end up staying up way too late, so I wouldn’t feel like getting out of bed the next morning and I found myself in the same vicious cycle of too little sleep, leading to lack of productivity (and earning myself the nickname “Crabby Abby”… 😉 ). So a little over a year ago, I decided it was time for a new evening routine. Instead of my late nights derailing my next day, my goal was to get everything in place so that our family could begin the following day on the right foot. With the time left between cleaning up and the boys’ bedtime, we usually spend time together as a family. Connor likes to shoot hockey pucks in the basement, so we’ll do that with him, and little Caleb likes to read or play a game, so we make sure to do that with him as well. 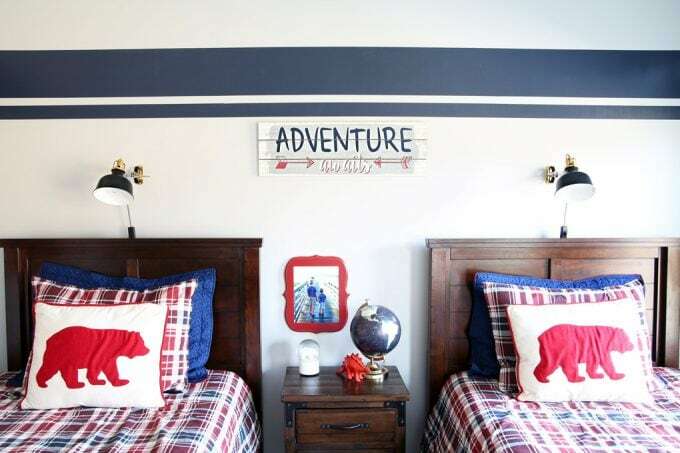 At 8 we head upstairs, help the boys get ready for bed, and tuck them in for the night. After we put the boys to bed, I get ready for bed too– put on pajamas, brush my teeth, take off my makeup, etc. Knowing my personality, I know I will try to squeeze in as much as possible before the goal “bedtime” I set for myself, so I try to get this stuff out of the way so I don’t end up staying up even later to do it. I then make my to-do list for the next day. I typically do this in my Intentional Life Planner so I can write-in my time blocking as well. This is another nighttime task that helps set the stage for tomorrow– since I have a plan of what I want to accomplish, it’s less tempting to sleep in or waste time in the morning because I have a list of everything I need to get done. I then usually flip on a show and do some sort of mindless household task, with a goal of being in bed by 10 pm. Sometimes this involves folding laundry, a task that I actually don’t mind doing because I can watch a show at the same time and still feel productive. Other times I’ll read a book or listen to a podcast. And other times, Donnie and I just hang out and catch up. Around 10 pm, I make sure that my phone is plugged in somewhere other than on my nightstand so that I’m not tempted to waste time scrolling either that night or the next morning. Sometimes I’ll plug it in in my office, and other times I just plug it in on the other side of the room– as long as I can’t reach it! Then I set my nifty alarm clock and head to sleep! Now what I just described above happens to a “T” when all of the stars align exactly and I’m completely on my game. Sometimes life happens. Schedules get in the way, I’m feeling more tired than usual, I have a deadline that needs to be met, etc. It is a work in progress, and that’s okay. We’re not working toward perfection here– just better habits. And as important as I think it is to have healthy routines in place in our lives, I think it’s just as important to give ourselves grace. Looking for more ideas for improving habits and routines? These posts can help! How does your evening routine set you up for success the next day? I’d love to hear about it in the comments! I find night routines to be difficult too. I work 45 min-1 hr away from my home, so if I stay a bit later at work, it throws off my entire night. Traffic can be such a you know what! I’m going to try to start a more productive routine as well. Thanks for sharing yours! Also very much a work in progress – I wake up at 5.30 am, so try to be in bed by 9.30 (ha!) as I need lots of sleep. And that’s after packaging lunch / gym stuff / work bag for the next day and putting an outfit out. However, it’s always a tempting time to work or read, or if we go to my mom’s house for dinner, to hang out with the family. It is such a temptation to be a night owl! I always think, “Oh, I’ll just finish this one more thing,” and then hours later I’m still up! Ugh! And kudos to you for waking up at 5:30! That’s an early start!! I like to have everything picked up and put away at night so we start off the next day without having to do it. A lot of times I am spent at the end of the night though. I am a morning person so I get a lot of things done then. Smart mama! I think having things picked up is such a big help! Hi, Abby. I feel a bit funny writing as I figure most of your readers are “girls” but I’m interested in starting a blog. I also can benefit from “routines” in the morning and evening, and throughout the day. But most of all, I am truly blessed by your faith in God and it is an encouragement when hard times are on you, me, and all of us from time to time – to put our trust in the Lord. I have read (and now will start again) reading My Utmost for His Highest which I noticed in the picture with the packing peanuts. The Bible also means a great deal to me. I just wanted to share those things, and hope it is an encouragement to you, as your stories are to me. Thank you so much for your words of encouragement, Don! That means a lot! (And great name! My husband and father-in-law and grandfather-in-law are all Don!) I love My Utmost for His Highest! I have been reading it off and on since early college and I still find new nuggets of truth in it all the time! Hope you are having a wonderful week! The same as Don, I am working on starting my own blog this weekend, Lord willing. My wife and I are working on our routines as well. I talk about this in my blog I just wrote on “I have no time!” to be published soon. Thank you for your blog. My wife and I have been reading them together. What a great routine! What time do your boys usually go down? Any tips on how to get kiddos down at a decent hour? I love that printable too… Headed over now to print! Have a great week Abby! Thanks, Sydney! My boys usually go down at 8 pm. They are usually awake by 6, though, so that’s probably why they’re ready for bed so early! We don’t really do anything special for bedtime… they usually get to watch a show and then brush their teeth, put on their PJs, and sometimes we read a story. Then they sleep. I wish I had a secret magical way to make it happen, though! I just found you blog and I am hooked. Every post I read, I just keep opening all of the internal links in new tabs (I currently have about 14 of your posts open… lol). Can’t wait to read them all and I will definitely be buying your e-book once I get caught up on the girl behind the book :). I have been blogging for a little while now, but have no clue what I am doing most of the time and your book preview just called out to me!!! PS I’m in love with your “to-do list” printable… thanks so much for that!!! Aw, yay! So nice to “meet” you, Colette! Thank you so much for your sweet comment! Hope you’re having a wonderful week! I love this new series of yours! Life has kicked into high gear around here lately for sure… your post is a wonderful reminder for getting back on track! Thank you so much, Mel! Hope you’re having a wonderful week! Hi, Abby! I experience the same difficulties at night that you do! 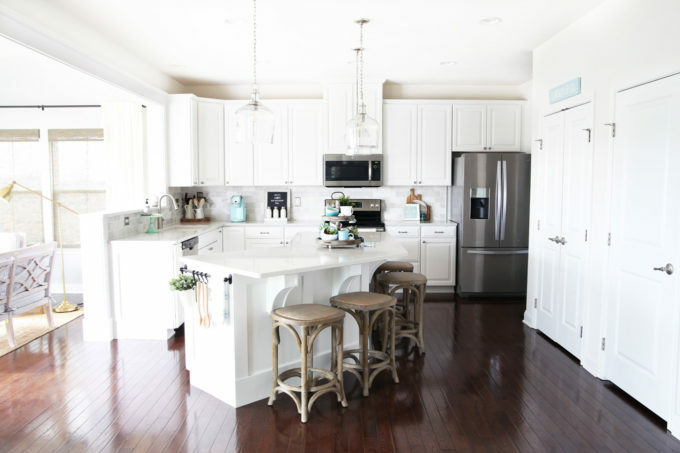 After dinner, I usually want to hang out with the hubby and kids instead of cleaning up and getting everything ready for the next day! I often stay up really late working on my blog and posts, etc. It’s tempting to stay up late, especially on nights when the rest of the family checks in early! It so is! I think bloggers tend to be night people, but I also am a bear without sleep, so I try to resist the temptation to stay up soooo late! Hope you’re having a wonderful week, Lauren! I just love this! I’m working on developing my own morning and evening routines. I see you comment on 3 blogs – is that a daily thing you do? Do you have a set number that you try to comment on? I’m struggling with how much time to devote to my blog to improve and build upon it (and get more feedback) – I’d love to devote all my waking hours to it …but obviously I can’t! It is so hard to figure out that balance, right?! If only there were more hours in the day! 😉 I set up my feedly so that I have certain blogs assigned to certain days and try to read and comment on at least 3 a day. I definitely don’t always succeed– it’s a work in progress! Hope you’re having a great day, Carol! Thanks for responding! That makes a lot of sense and gives me some ideas. Thank you. Enjoy the rest of your day as well!! “Crabby Abby” – ha! I’m glad I’m not the only one who is noticeably grumpy when sleep deprived! 😉 I’m so glad you decided to share this post now and not wait until New Year’s (when everyone is on the “better habits” bandwagon). I NEED a better evening routine this holiday season. Lol! Good to know I’m not alone! Hope you’re having a wonderful day, Aimee! I make sure to stay off my computer about 2 hours before bed to help me wind down. I also love writing down the next days to do list so it’s out of my brain. Yes! Both of those things are SO helpful! I love these simple and totally doable tips! I love that you make your to do list the night before. Thank you for the helpful tips! I am actually a morning person, so I love to get started on my tasks for the day. I can definitely use these for a more productive morning! We recently re-evaluated our evening routine as well. Chores were backing up and we discovered it is so much more productive to divide and conquer and have a clean house to wake up to the next morning. The getting to bed on time? Still working on that one! I need to put back together my nightly routine – I found it was even more important than my morning routine! But I just moved, and in my new place I have enough closet space for a “war room!” (If you’ve seen the movie, you’ll know what I’m talking about!). This week I started going to the “war room” at 9pm each night, or if I get home later, then I head in there a few minutes after I get home. I found it hard to have this dedicated time in the morning because if I wake up late I don’t have time before work and it just doesn’t happen, so at least until I get a better handle on my mornings, the nighttime date with the war room seems to be working really well for me. Oh, awesome! So glad you’ve found something that works for you, Joy! Great night routine. I wish I had one when my children were small. I have one now and it is to prep for the next morning. My morning goes so much better when my night was productive. It makes such a difference, doesn’t it?!? Night time is hard for me, I stay up wayyyy too late! The daytime is so hectic for me that all I want to do at night is relax. I have a very hard time getting the kids involved with after dinner tidy up, but they are old enough and certainly capable! It’s usually bath time for our 2 younger boys right after dinner (this is when I’ll do the dishes and tidy the kitchen) then their routine is brush teeth, story time, then sleep. I aim for lights out at 8pm and we usually fall asleep with them, which doesn’t help our nightly routine! lol! My 13-year-old daughter is somewhat of a night owl and has always had problems with sleep. She likes to be on her own most of the time but sometimes we’ll watch a show together or just spend time talking and catching up. Once the kids are settled, it’s decompression time for this mamma! lol! One thing I like to do as well is write out a to-do list for the next day; I find this settles my mind quite a bit! Yes! That’s definitely the biggest thing for me. I sleep so much better when I write out my list the night before and get it all out of my mind! 🙂 Hope you’re having a great week, Ann! I’m right there with you on #4!! I always get way too sleepy and it’s all I can do to get my face washed before bed! 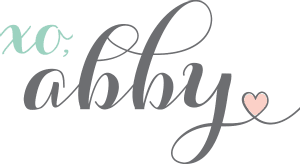 Abby, I am so happy to have you and your website/blog. I am 70 years young, newly retired and am struggling to (re-)organize my life. I was organized at work and semi-organized at home or visa versa…Never organized in both places at once. My life though, now, has taken on a new complexion! I am struggling not to go straight to the TV for news and weather (leading to sitting watching food or DIY shows)’til I have wasted my day. I have always believed in putting the “Whole Armor of God” on in the morning but have gotten away from that and sometimes don’t even get there at all during the day! I am getting ready to do a large re-organization of my office (am starting an Encouragement Card Ministry) and your printables and info with them is invaluable to me! If my ministry is to flourish with encouragement and hope to others I need to get back in the Word consistently Your routines are an inspiration. I also love using My Utmost for His Highest but was just given another devotional that I love too. I mentored a young seminary student and was gifted “Morning and Evening” by Charles H. Spurgeon (updated edition) by the faculty. 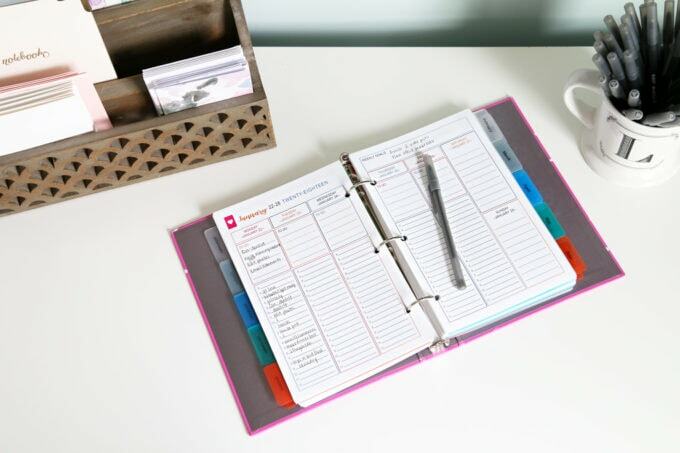 I’ve ordered your home binder and am hoping that I’ll soon be one my way to reorganization and ministry wrapped up in one! Thanks for all you share with us! Have added you to my prayer list! God Bless! Will update you with my progress!